According to the Central Intelligence Agency's 2011 World Fact Book, Vietnam ranks seventh in the world in terms of navigable rivers, canals and inland bodies of water. When you compare the size of most of the countries above it on the list, which includes the United States, Russia and China, you realize how much water Vietnam has per square mile. All this water means plenty of kayaking opportunities, but there are just a handful of established kayak tourism points in Vietnam. rock formations. 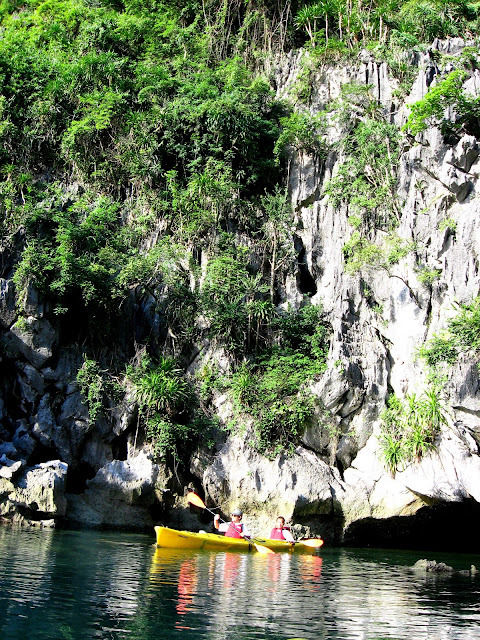 With thousands of limestone karst rock islets soaring from its waters along with caves, mangrove forests and sandy beaches, the bay offers spectacular kayaking opportunities. Caves give way to hidden lagoons, channels are bordered by tall cliffs covered in lush, green vegetation and locals sell crafts and snacks on small boats around the bay. Many people choose to stay on a traditional junk boat in Halong Bay and take day trips by kayak to secluded lagoons, caves and floating markets. The best time to visit is October to June, but kayaking is available year round. Halong Bay is connected to Hanoi by bus and taxi. Located in the Can Province northwest of Hanoi, Ba Be Lake is the centerpiece of Ba Be National Park. Surrounded by tall limestone cliffs, the shores of the 4-mile-long lake host traditional villages inhabited by ethnic minorities making their living farming and fishing. The tropical forest in the surrounding park is home to 300 wildlife species, including one of the world's rarest primates, the snub-nosed monkey, and more than 400 plant species. Kayaking is usually offered as part of a tour of the national park, which also includes biking and visiting traditional villages. Kayak tours include paddling on the Nang River followed by an entry onto the lake through a striking 100-foot-high, 1,000-foot-long cave. The bus ride from Hanoi to Ba Be Lake takes six to eight hours. Probably the best known waterway in Vietnam, the Mekong Delta is actually fairly new in the kayak tourism industry. The locals have been paddling these rivers and canals for centuries using their famous stand-up paddle method, but most tourists view the region from larger boats. Located to the south of Ho Chi Minh City, formerly Saigon, the Mekong Delta has a flatter terrain than the destinations to the north. The river is lined with farms and towns and river traffic is high in some areas. A network of tiny canals cuts through the water plants on the banks, leading to small villages and floating markets. You can kayak along the Mekong, staying the night in small guesthouses along the way. If you join a kayak tour, you will be able to visit local farms, gardens and homes. Many tours also use a larger boat with sleeping cabins as a base. Located about 600 miles south of Hanoi, the Perfume River winds its way through verdant tropical forests dotted with ancient pagodas and the tombs of several Nguyen emperors, including Gia Long and Minh Mang, to Hue on Vietnam's eastern coast. In addition to the tombs and pagodas, kayakers can visit a traditional bronze casting village and Sinh village with its rustic paintings. Bicycle trips just off the river visit sites such as the Royal Tiger Arena, an historic animal fighting place, and Emperor Tu Duc's tomb.